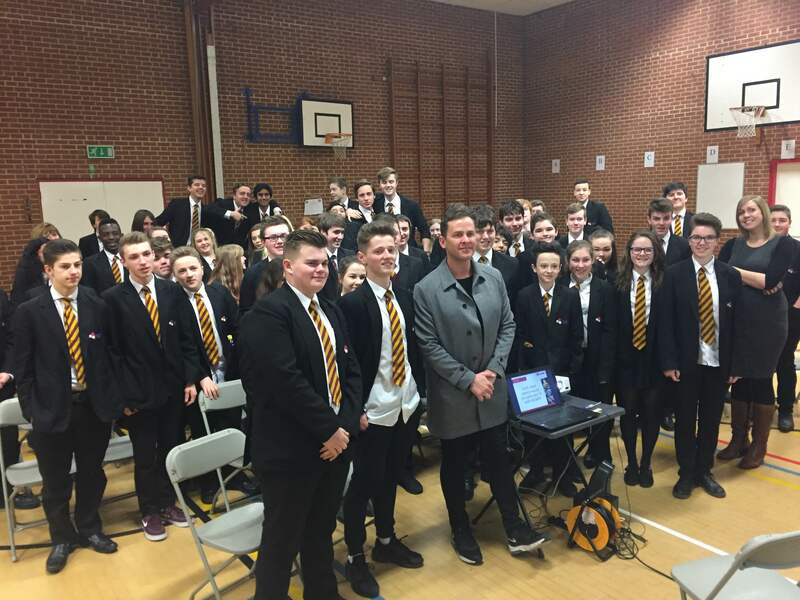 BBC Radio 1 DJ Scott Mills has gone back to school in Eastleigh as part of a nationwide scheme to inspire current students to career confidence and academic success. Scott urged current students at his former school, Crestwood College for Business and Enterprise in Shakespeare Road, to believe in themselves and told them that with hard work, they could achieve their chosen career. He was made honorary Deputy Head Boy after chatting to current students about his career path which took him from Hampshire local radio to acting, an appearance on BBC TV’s Strictly Come Dancing and presenting Radio 1’s weekday afternoon show. Scott returned with the national education charity Future First which enables more than 400 state schools and colleges across Britain to harness the talents and experience of former students to support the current generation. More than 150,000 former students have signed up with Future First to support their old state schools or colleges. Many alumni work as career and education role models, work experience providers, mentors and e-mentors and as fundraisers, governors and donors. For further information about Future First, visit www.futurefirst.org.uk, contact Press Officer Sue Crabtree on sue@futurefirst.org.uk, Senior Communications Officer Anna Darling on anna@futurefirst.org.uk or call one of the Future First team on 0207 239 8933.